Weather 14 days. Forecasts, Maps, Satellites, Radar and Live Tile or Widgets. 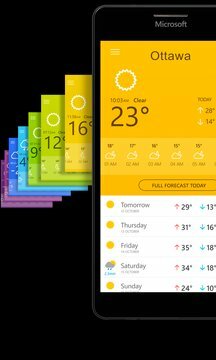 Weather 14 days is completely FREE with the latest weather information for Canada and the rest of the world. Featuring detailed 14 day forecasts, maps, satellites and radar. Compatible with any Winwdow 10 smartphone, tablet, Surface or PC. 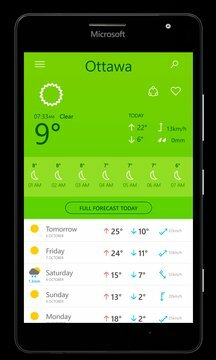 Hailed by fans meteorology, the app features a modern layout based around Google’s Material Design making it very quick and easy to use. - Customize the app with your favorite locations like Toronto, Montreal, Vancouver, Calgary, Edmonton, Ottawa, Hamilton, Winnipeg, Kitchener ...or foreign cities such as Barcelona, Paris, London... We have over 450,000 locations all around the world for you to choose from. - Customize your smartphone with our widgets, display temperature in your notification bar and select your preferred units such as Celsius, Fahrenheit or Kelvin. -Check the daily forecast screen to see current weather conditions along with the main forecast information for the next 14 days. Browse between your favorite locations with a simple swipe of your finger and remember...the background color of the app changes depending on temperature conditions. - Select a day to view detailed hourly weather information including temperature, rainfall, humidity, pressure, wind speed and direction as well as sunrise and sunset times and even the phase of the moon. - Don’t forget to try turning your smartphone sideways for the best view of our informative weather graphics, probably the best channel to check the weather variations. - Check our animated forecast maps detailing temperature, rainfall, cloudiness and pressure for Canada along with the rest of the world. - Watch animated Radar maps detailing recent and current rainfall with information provided by the NWS. These maps feature standard pinch/zoom capability allowing you to zoom in and out smoothly. - Once you’ve installed Weather 14 days why not customize your Mobile Desktop with our great looking Live Tiles. Get the current conditions updated hourly along with the forecast for the following days. - Choose between four different Live Tiles. - Share weather information with your friends and family anytime using social networks sites like WhatsApp, Facebook and Twitter. - App available for Canada, France, Spain, United Kingdom, Portugal, Deutschland, Netherlands, USA, Mexico, Italy, Brazil, Australia, New Zealand, Russia and many more.